CAPE CANAVERAL, Fla. – A rocket engine nozzle concern has delayed the maiden test launch of a new private space capsule to no earlier than Thursday (Dec. 9), the spacecraft's builder said. The California-based private spaceflight company Space Exploration Technologies, or SpaceX, was planning to launch its Falcon 9 rocket and Dragon space capsule on Tuesday (Dec. 7). But the company now says it will will need until at least Thursday to make the attempt. "Turns out in the final review of closeout photos, we found some indications on second stage nozzle that we're spending some time investigating," said Gwynne Shotwell, president of SpaceX, during a Monday press conference. The teams are now "doing test and root cause analysis." If the engine nozzle must be replaced, SpaceX would aim for a Friday launch. The company has until Saturday to lift off the rocket, and then must stand down and wait until another launch window becomes available. The Dragon capsule will blast off from Launch Complex 40 at Cape Canaveral Air Force Station here. 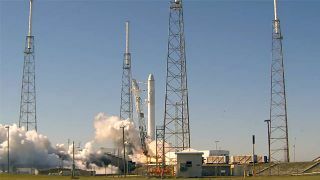 It will launch on SpaceX's two-stage Falcon 9 rocket. It is that rocket's second-stage engine nozzle that SpaceX engineers are studying. The Dragon spacecraft is intended to carry cargo – and eventually people – to low-Earth orbit. SpaceX already has a contract with NASA to use the system to resupply the International Space Station after NASA's space shuttles are retired next year. Ultimately the company hopes to use Dragon to carry astronauts and tourists to space. The Dragon capsule will then re-enter Earth's atmosphere and make a water landing in the Pacific Ocean, after which SpaceX personnel will recover it by ship.